There’s a time and place for everything. Sometimes it simply calls to have a decadently fancy night out on the town and Caprice Bar offers a place to do it. 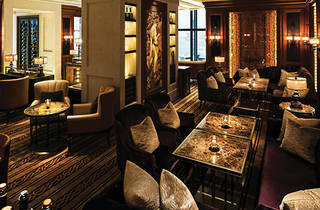 Award-winning fine French dining kingpin Caprice, housed in the suave Four Seasons hotel, has transformed the small private waiting area, adjacent to the dining room, into Caprice Bar – a tasteful, intimate and comforting fine wine and cheese room, with Persian and European flair, designed by Spin Design Studio and the Alan Chan Design Company. Deep earthy and purple tones, and bold prints and textiles frame a mesmerising lounge-like atmosphere, perfect for winding down in after a busy day at the office. The bar doesn’t take any bookings but do drop by and be dressed-to-impress as the establishment has a firm dress code. 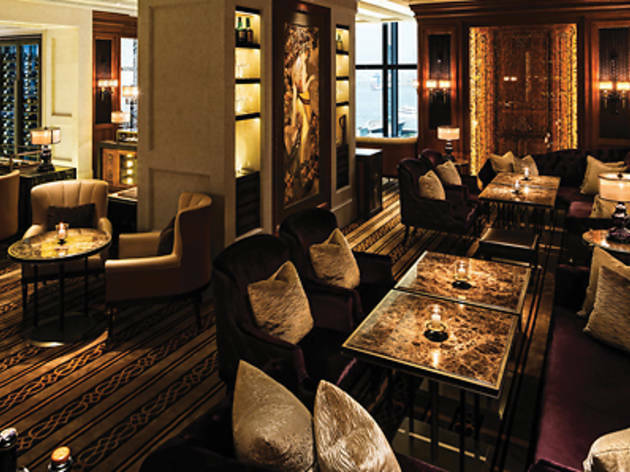 You’re going to want to make the effort anyway, as you’ll most likely be sitting snugly away on the same lush and expansive sofas as Hong Kong’s elite, who are sure to stop in and lounge around for some demure pre-dinner sips or a sophisticated nightcap. The menu includes an extension of Caprice’s far-ranging wine list, spotlighting an array of unique wines and champagnes – by the glass – that change routinely, including the Saint Joseph Dom B Gripa 2007 ($150) Syrah, which we try on our weeknight visit. We suggest those who want the ultimate Caprice Bar experience to order the wine and cheese pairings the bar offers. Order the A Bit Of Everything sample cheese platter ($280) and those in the mood for some fine cheeses including Aged Comté or Chèvres should be content. If you opt for the wine pairing, $280 will get you three glasses of wine and $370 will you get four. Variety is the spice of life, after all. For those who aren’t big fans of cheese or wine, Caprice Bar also stocks a pretty well rounded standard supply of other liquors and sips. Whiskeys and gin and tonics may not be on the menu but they’re available if you politely ask for them. 6/F, Four Seasons Hotel, 8 Finance St, Central, 3196 8860; fourseasons.com/hongkong/dining.